To say Luxor is one of the world’s greatest cities is nothing less than an understatement. It is, in fact, one of its most astonishing, if not singularly the best, outdoor museum anywhere on the planet and offers visitors the chance of seeing almost a third of all the ancient antiquities known to man in just a few kilometres. The temples and structures that have stood for thousands of years are beautifully preserved. Home to the city of Thebes, the ancient capital of Egypt during the Pharaonic New Kingdom period, along with the fabulous Karnak Temples, Luxor Temple and the necropolis of the Valley of the Kings and the Valley of the Queens, Luxor can trace its history back to unimaginable times. It actually has three distinct areas, the city centre on the East Bank of the Nile, Karnak which is a town in its own right and lies just to the north and Thebes, location of the Valley of the Kings. The city is said to have gained importance as early as around 2000 BC under the rule of the 11th dynasty. In ancient times it was known as Waset, a name that indicated its power, and later Thebes under the Greeks. 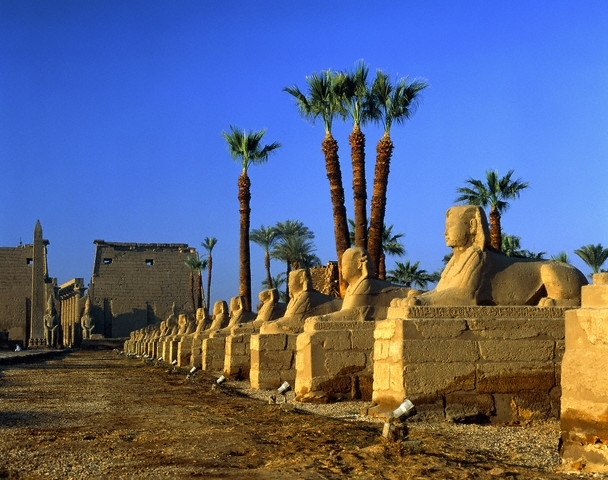 Homer is said to have described Luxor as the ‘City of the Hundred Gates’. It was, for a great many years, one of the most important cities in the world, and certainly at the centre of political, economic, religious and military life of Ancient Egypt. The Luxor of today is a compact city, running lengthways along the banks of the Nile and bordered by the desert. Its population stands at around 380,000 with a regular stream of international visitors increasing this figure during the spring and autumn months when the temperature is at a pleasing level for sightseeing. Temperatures of 31-40°C (107.6°F) in June to August are not uncommon. Luxor’s size makes it easy to navigate. It’s a short hop of 20 minutes or so from the Luxor International Airport into the city centre, which largely only comprises three main roads. The corniche, a pretty tree-lined boulevard that runs along the banks of the Nile in an esplanade fashion, is central for all the city’s attractions. It is home to the Winter Palace Hotel, now run by the hotel group Sofitel, that was where Agatha Christie is said to have penned her classic work ‘Death on the Nile’. The two other main roads are the street al-Mahatta in which lies the train station, and the street al-Karnak that runs from the Karnak Temple into town past the Luxor Temple. For visitors the size and layout of Luxor means that all the sites are within a short distance of each other and easy to find. Getting across from the East Bank or city centre to the West Bank to visit the Valley of the Kings and the Valley of the Queens is now straightforward by road with the opening of a bridge ten years ago. It’s just a few kilometres upstream. Before the bridge opened it was very much a case of hopping on one of the frequent and inexpensive ferries or motorboats that ran, and still do run, across the Nile. There’s a landing just opposite the Luxor Temple. It’s a great way to cross the river. 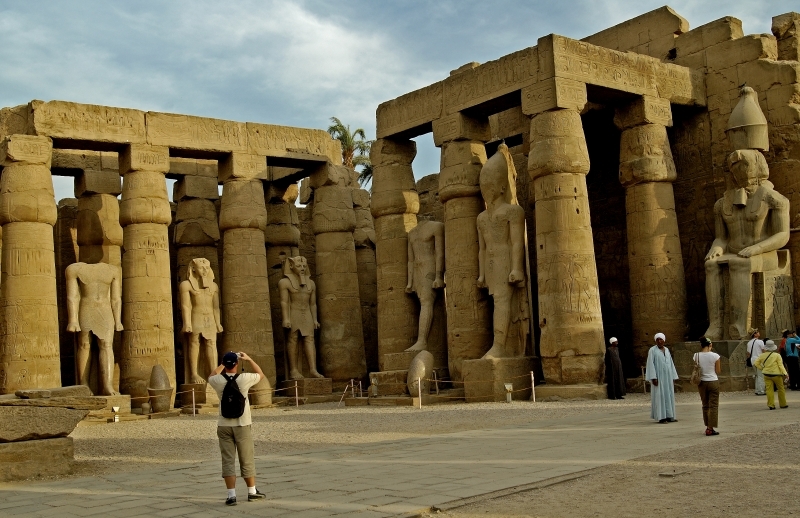 Visitors have a wealth of opportunities to sightsee in Luxor. 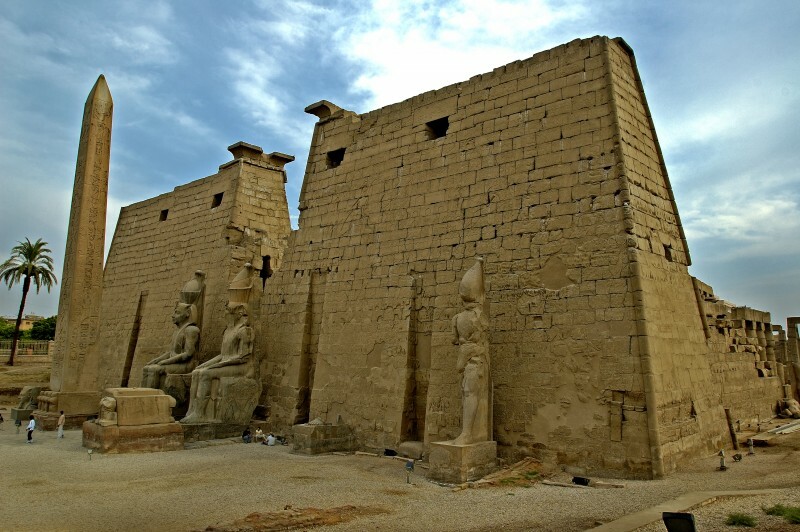 There are the two big attractions of the Luxor Temple and the Karnak Temples, of course, plus the fabulous Luxor Museum and the Mummification Museum. The Luxor Temple is an astonishing sight from the corniche. It is particularly attractive when subtlety lit in the evening. Dating from the time of Amenhotep II and Ramses II, it is dedicated to the god Amon Ra and his wife Mut. You enter it from an entrance facing north, at the point where at one time it would have been connected to the Karnak Temples via a causeway. The causeway, which is currently being restored and is set to be a highlight of Luxor, would have been lined with sphinx statues. A later addition was a long road, a dromos, built by Nectanebo I in the 30th dynasty. Sadly, most of the sphinxes have disappeared over the years, but a few exceptionally good examples still exist close to the temple today. 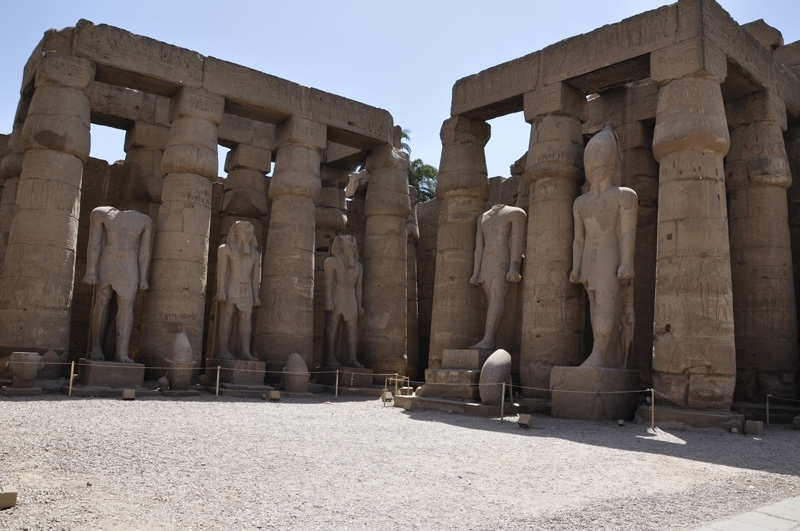 Built during the New Kingdom, the temple is entered past a huge pylon built by Ramses II, with two of the original six statues representing the king on either side. There is also the remaining one of two matching 25-metre high granite obelisks. The other is erected in the Place de la Concorde in Paris, and a much loved and photographed landmark. 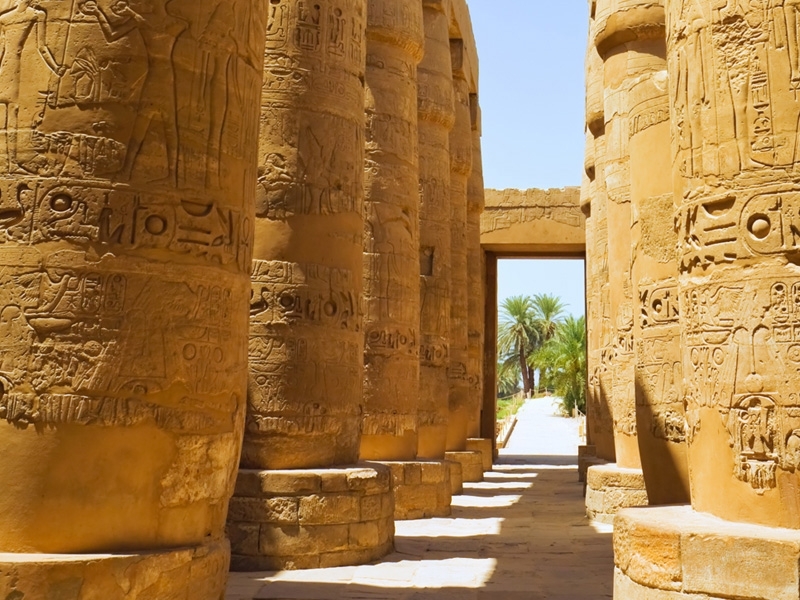 Inside, there are courtyards, columns and fabulous colonnades, one a hundred metres in length and built byAmenhotep III. Its columns are topped with carvings of the papyrus plant. Along the way there are inscriptions, scenes from ancient Egypt and even Roman stuccoes that can be seen partially covering ancient Egyptian hieroglyphics. On the outer wall of the pylon are inscriptions that tell of the battle between Ramses II and Hittites. The temple is a glorious celebration of the power of the pharaohs of the New Kingdom and a ‘must see’ sight. Heading out of the Luxor Temple towards the next ‘must see’ sight,the Karnak Temples, you will reach the Luxor Museum on the corniche. Be sure to go inside. Quite modern in appearance, it was founded in 1975 to house antiquities dating from the ancient civilizations of the area found in more recent times, including some of the Tutankhamun treasures. While the Egyptian Museum in Cairo displays ancient artefacts to perfection, it is quite moving to see such extraordinary items exhibited in Luxor, the city where they were found. 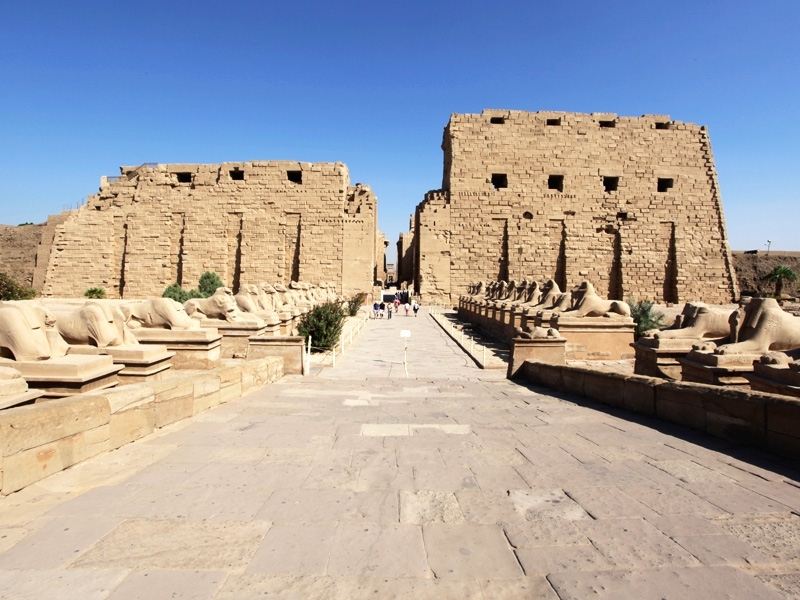 The Karnak Temples barely need an introduction, they are so famous. The largest ancient religious site in the world, the complex takes its name from the village of Al-Karnak and, in fact, comprises three distinct temples. 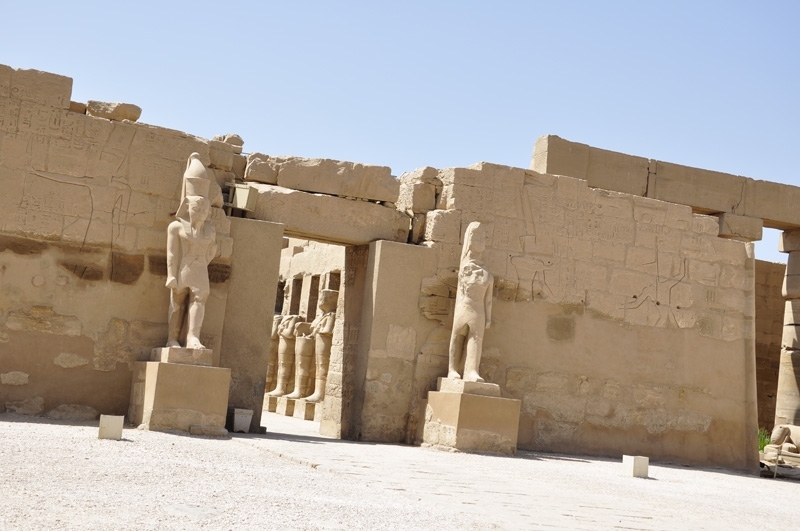 The largest, the Precinct of Amun-Re, is ancient and dedicated to the god Amon. It is the only area open to the public. There is also the Precinct of Montu, the Precinct of Mut and a now dismantled building, the Temple of Amenhotep IV. The triad of Luxor is Amun, Mut and Khonsu. The site dates from as far back as 2000 BC and although building would have been low key in the beginning it is said that around 30 pharaohs added buildings, temples, chapels and architectural wonders to it over a period of about 2,000 years from the Middle Kingdom right through to Ptolemaic times. The result is a fabulous treasure trove of ancient buildings and structures, columns, courtyards, pylons and obelisks, even a sacred lake, the scale of which is unparalleled anywhere in the world. At the entrance you pass over what is believed to have been a canal connected to the Nile, complete with an ancient dock. Sadly, there is little remaining of the dock today. The entrance road, dromos, is lined with a row of statues either side and is known as the Avenue of Rams. The statues represent Amon and are beautifully preserved. 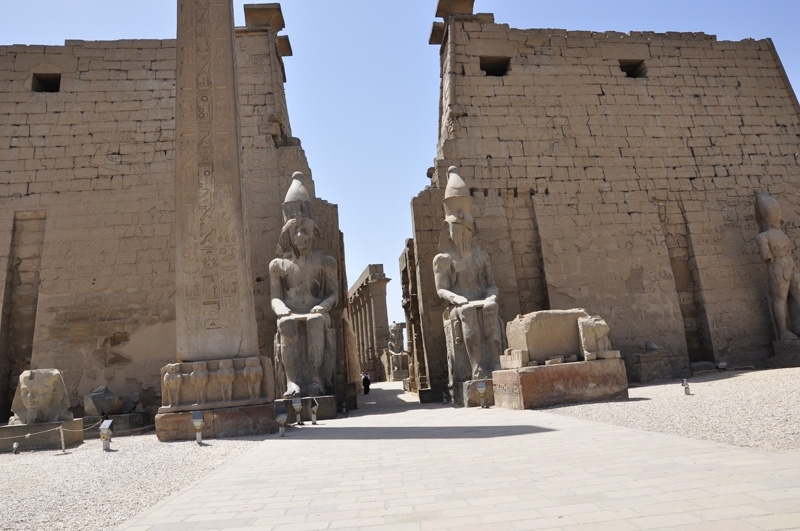 Once inside the building be sure to see the huge statue of Ramses II, one of the iconic images of the Karnak Temples. Other major sights to see on the East Bank of Luxor include the Mummification Museum, which is located right on the corniche. It has a huge sign outside and is really easy to find. Inside, there’s a graphic display of how the ancient Egyptians would mummify not only humans, but also crocodiles, of which there were plenty in the Nile, household pets and even fish. All are exhibited in mummified form, including the body of Masaharta, a High Priest of Amun in Thebes around 1050 BC. In the museum you can also see examples of the tools used to remove bodies’ vital organs and drain fluids, and to replace voids with salt, plus artefacts like embalming fluid, canopic jars and coffins. Like the Cairo Mummification Museum inside the Egyptian Museum, this is fascinating place but not one for the faint hearted. which is a wooden sailing boat, or one of the motorboats that can be seen making their way up or downstream at most times of the day. The landing stages along the East Bank are the starting point for many of the cruise ships that run to and from Aswan too. On the West Bank, the Valley of the Kings, the Valley of the Queens and the Valley of the Nobles, plus many other fabulous temples and structures can be seen. Look out for the Madinet Habu Temple, which includes temples to Amenhotep I and Ramses III, the two huge statues known as the Colossi of Memnon, the funerary temple of Ramesseum and the landmark temple to the great femalepharaoh Hatshepsut, the elegant building known as the Temple of Queen Hatshepsut at Deir El Bahari. Carved into the sheer limestone rock face, the beautiful temple has three floors and a long sweep of steps and a walkway as its entrance. It is said to have been designed by the pharaoh’s own architect Senenmut during the time of the 18th dynasty. It makes an astonishing, almost haunting, sight from the East Bank. To one side of Hatshepsut’s temple are the ruins of the Temple of Montuhotep II, while to the other is the Shrine to Amun and the Sanctuary of the Sun. A row of statues are said to depict the queen, although appear in a male form. You can also visit the Chapel of Anubis where the paintings and reliefs on the walls and columns are fascinating and retain much of their original colour. They tell the story of Hatshepsut, one of only three females to have ruled Egypt.